Could search engine queries predict Emmy winners? Perhaps. 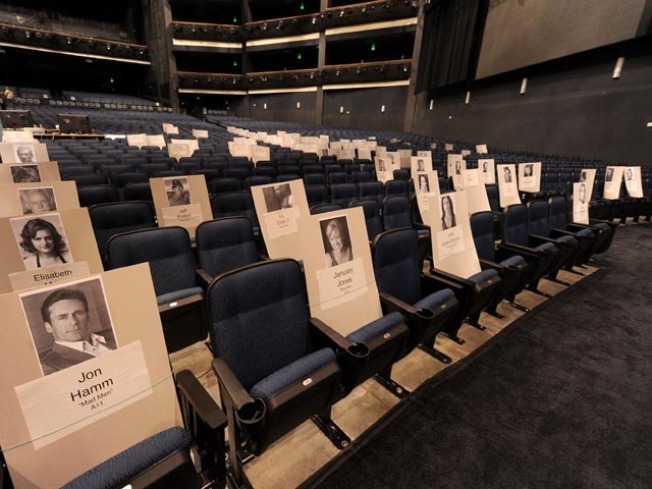 Celebrity seating place cards are displayed during the 62nd Primetime Emmy Awards press preview day at the Nokia Theatre. Until Ernst & Young starts giving out sneak peaks at Emmy envelopes, there's no real way to guarantee Emmy winners. We can try -- and we certainly do -- but Emmy voters are fickle, fickle people who love to surprise us. So in an effort to win our office pool, we turn to a new treasure trove of Emmy analysis: Yahoo searches. The search giant has put together the buzziest nominees based on Yahoo searches from June 1, 2009, to May 31, 2010. Think of it as the People's Choice Awards meet the Emmys. Now, obviously "the people" are not Emmy voters. Otherwise, "American Idol" would probably top "The Amazing Race" every year. And search engines are not always places that reflect real life. Don't tell this to a tween, but despite massive search queries, Justin Bieber is not the most important person in the world. Still, perhaps there's something to be learned from this list. Any analysis is good analysis when it comes to filling out that perfectly predicted Emmy ballot. Well, it was either this or consulting with Paul the Octopus.